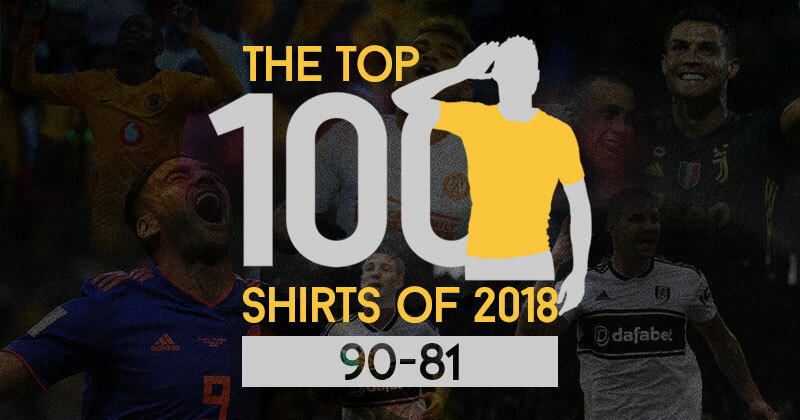 Welcome back to Top 100 Shirts. After the big launch of the list, we’re back with numbers 90-81. In my personal opinion I don’t think adidas have reached their potential on the club scene this season, which was a shame after such a strong set of international shirts. That being said, there’s some great adidas club shirts in this section. But it’s not just the German giants involved, Nike, Macron, Umbro and Kappa are all represented. So dive into part 2 of our series, and remember I’m always keen to hear what you agree or disagree with over on Twitter. I’m a big fan of MLS kits. Since 2004, adidas have had exclusive rights to produce kits for teams across the league and whilst many people argue that a league-wide brand = a lack of creativity, but I would argue there are great opportunities for the brand to experiment and test designs without having to worry about that contract renewal date coming up. 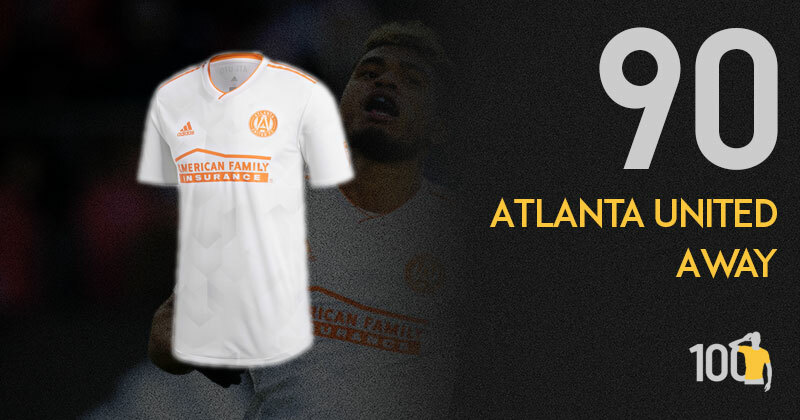 One of the best this season is Atlanta’s peach-tinged effort. It’s a superb design and the sort which is really coming back into fashion this year (see Spain away for a different flavour). Atlanta is known for peaches and the club use this as inspiration for the shirt. Logos, sponsors and stripes are all, unsurprisingly, in peach. This contrasts well with the white shirt which itself has a subtle panel pattern decorating it. This is the type of pattern that Adidas do so well and although it might look familiar, the pattern has been inspired by the stadium’s amazing Mercedes-Benz roof. It wasn’t my one of my favourites to begin with but it has grown on me. King Peach may not be the King of this list but it certainly deserves a place on it. I don’t know where to begin with this shirt; some people love it and some people hate it. It’s difficult to determine if the pattern is supposed to look like someone has drawn a forest using charcoal or if it’s just supposed to make the shirt look as if it is made out of velvet. Either way it’s a unique design and definitely one of my favourites from this year. There’s something about this kit that just ain’t the same. Although it’s incredibly simple, the design is really something else. Glad they took a risk on this kit because it certainly has paid off. For me, this black velvet looking kit should’ve been higher. A brilliant kit that reeks of cold-war class. White pinstripes on a red shirt is always a winner, the distance between stripes is perfect and the stylised “1948” tucked just under the bottom of the badge adds a modern twist. Add a nice v-neck collar and the national flag on the back and it all comes together. 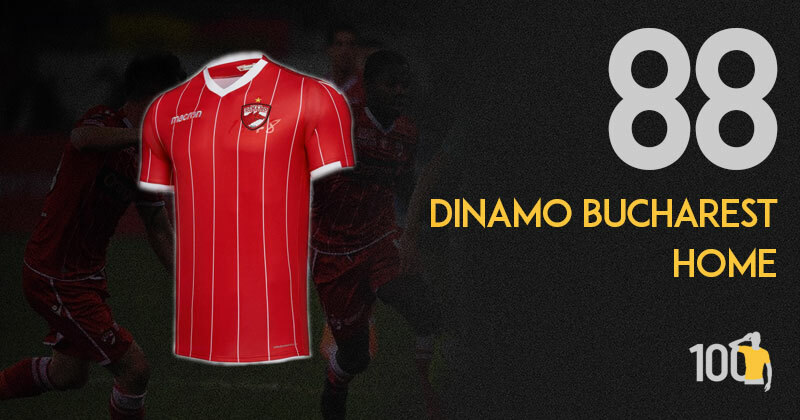 Macron have released some great shirts this year and this Dinamo Bucharest home shirt is one of the best. To compliment Dinamo’s traditional red home shirts, white pinstripes have been added giving the shirt a more elegant look. Behind the club badge, the year of the club’s foundation is embossed into the fabric and a Romanian flag can be seen on the back of the neck. There isn’t a lot to this shirt, yet this minimalist design still looks classy. Although this kit is from the same mould as the France 2018 Home Kit, it still deserves a mention as Nike have done just enough to make it stand out. No where near as American as the 94’ away kit, but still rather classy with some nice subtle details. 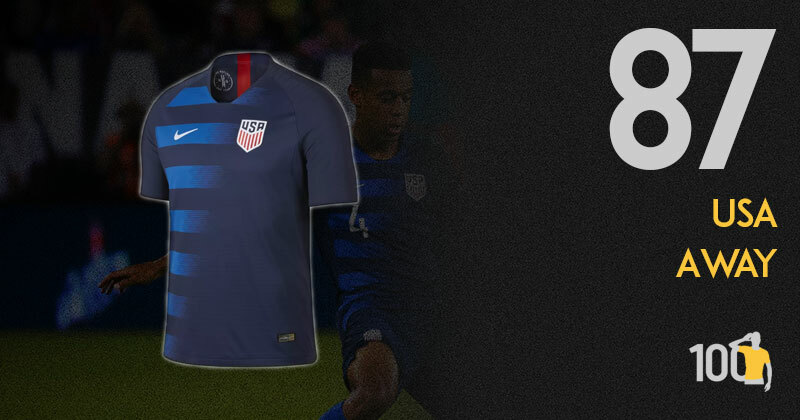 I’m always a big fan of home and away strips that follow the same unique template so it’s no surprise to see both of America’s shirts on this list. The only difference between this piece and the home one is that the hoops fade in an opposite direction. However the colour scheme isn’t particularly inspired and is relatively modest in comparison with the innovative design, meaning that with a few slightly more vibrant shades this could have placed a lot higher on our list. A strong and classy effort nonetheless. 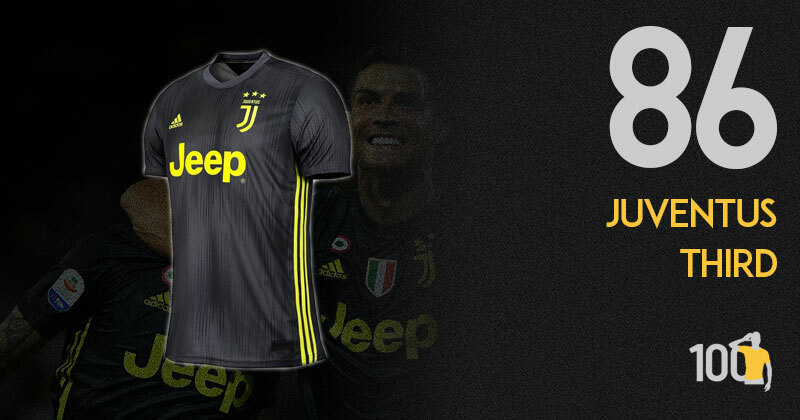 Juve’s Third Kit at a glance, just seems to be carbon copy of the others, but take a second look you’ll see it’s more than that. The gunmetal shade clashing with the bright yellow just works and really complements the new Juve logo. The wicked stitching pattern running up the kit is class too. Now I’m not hugely keen on this shirt. The dark grey itself isn’t too bad, but the bright yellow secondary colour looks really quite shocking, and for me not in a good way. The textured look of the kit isn’t great either, and almost looks as if it was made of duct tape stuck together. However, it’s hard not to respect the usage of recycled materials. adidas went above and beyond with their international kits this year, creating retro-inspired designs that had everyone frothing at the mouth. On the club side it looked for large part that they’d gone a little too vanilla, but Fulham’s home kit was an example of their wonderful international approach. The shirt is inspired by The Cottagers lovely late 90s kits, and it’s a strong look which they should come back to again and again. Simple but really effective. A nod to the late 90s classic, that definitely belongs to the west London club and no-one else. 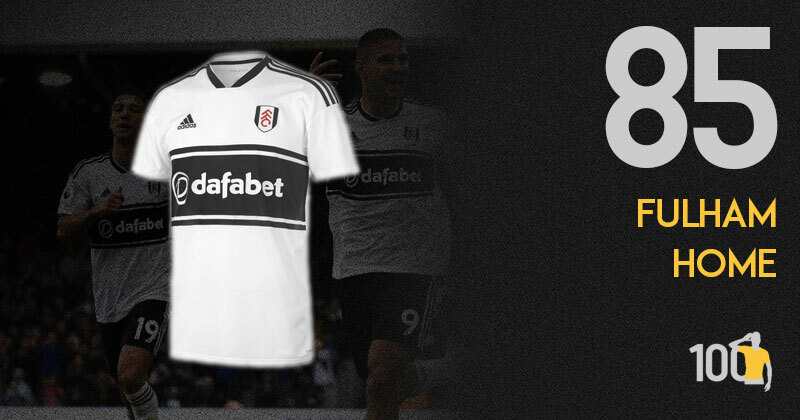 The collar sets the whole thing off and it is an excellent modern rendition of a kit that will remind Fulham fans of a wonderful period in their history. Not the traditional sky blue of old Hammers away kits, this colour is Gibraltar Sea apparently. Is a nice departure from tradition and the cut, collar and retro umbro trim help it along. Still prefer the third kit, mind! Umbro have been making waves this year, largely thanks to their uniform approach to cuffs. No matter how many times I see their double diamond trim on the sleeves, I don’t get bored. 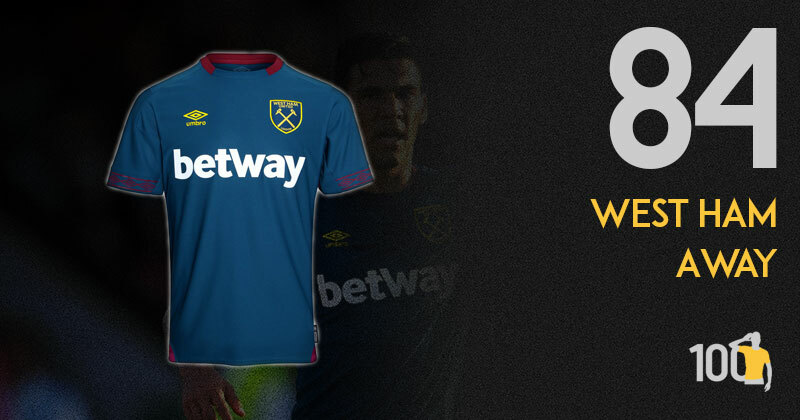 All of West Ham’s shirts are glorious this year, and their away shirt is my favourite of the lot thanks to it’s perfectly weighted colour scheme. With a better sponsor this easily moves us several spots. 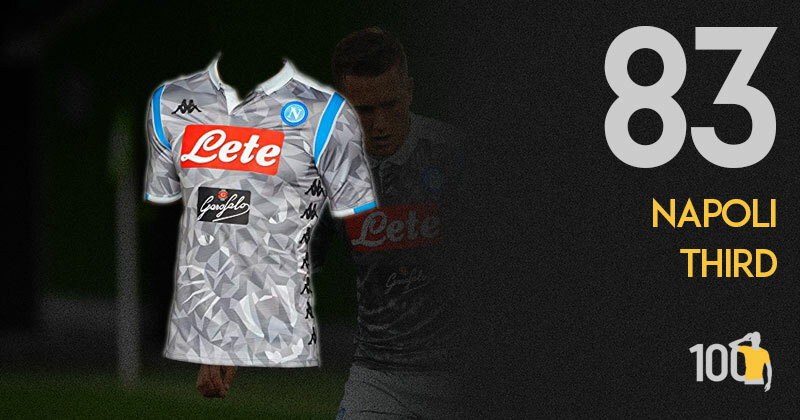 Napoli’s shirts in recent years have made headlines and truly divide opinion; like marmite, you either love them or hate them. Whilst guaranteed there is a lot going on - too many sponsors for many peoples liking, large Kappa branding and an intense diamond-like design on the front - there’s no denying it’s an intriguing piece. The hidden tiger on the front though, convinces me it deserves a place amongst our top 100. The smashed glass style pattern could be interesting, but the usage of those shades of grey leaves it looking dull, and the other elements of the shirt work in tandem to make it look even worse. The white leading from the collar down the shoulders looks really out of place, and that’s not even mentioning the black and white stripes at the end of the shoulders. There are some clubs who consistently deliver in terms of shirts. 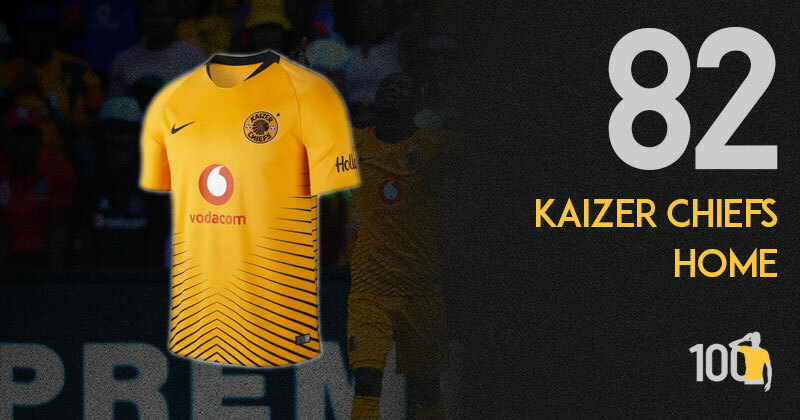 Thanks to their iconic name, strong colour scheme and long term partnership with Nike, Kaizer Chiefs are a regular on any top shirt list. 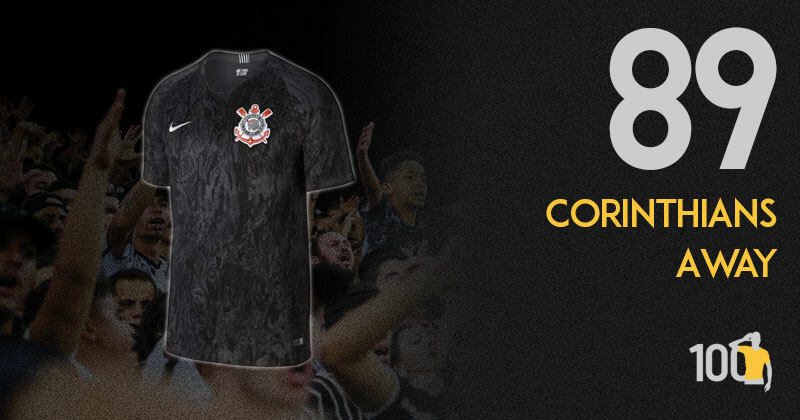 This year their home shirt is one of the best going, with a unique pattern which captures the angular dynamism you find on all the best Chiefs shirts. I’m not sure what angular dynamism is exactly but I’m going to use it in future. Nike get this just right. Predominantly orange with some black diagonal lines emanating from the bottom and ribs towards the centre. The sponsor detracts a little but this is a home kit fit for the South African Chiefs. This is another shirt wrapped up in a favourite World Cup memory for me. 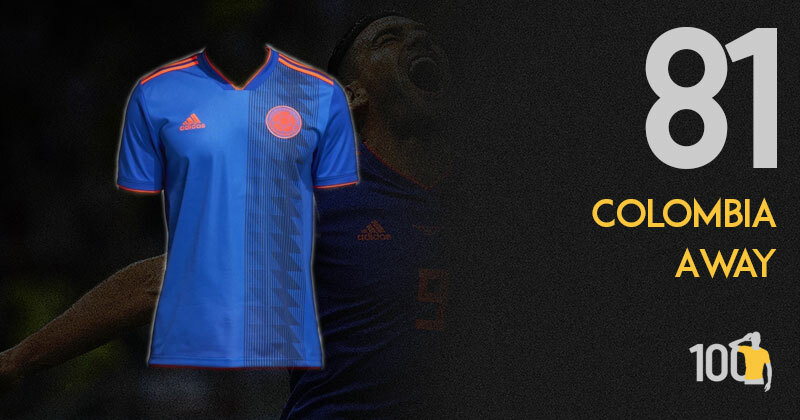 Colombia’s demolishing of an out-of-sorts Poland on matchday 2 was a truly magnificent attacking display, made all the more memorable by their really strong away kit. The luminous orange popped out perfectly against the blue, and the subtle pattern running down the front is the kind of thing adidas do best. Colombia went for a very bold effort with their away kit this year and it has really flown under the radar. A distinct blue pair with an eye catching orange is a potentially risky mix, but adidas have gave it their touch and made it work. So, that’s numbers 90-81 on our list. What do you think? Are we completely off the mark with anything here? How could we possibly think there are 95 shirts better than the Betis home kit? As usual, let me know what you think over on Twitter!